As Journey's development cycle ends, so does Thatgamecompany's contract to make its games exclusive to PlayStation platforms. Indie developer Thatgamecompany, currently best known for its small, arty titles flOw and Flower, is set to launch its next project, Journey, on PSN March 13th. Like its predecessors, Journey will be a PlayStation exclusive, but if current negotiations go through, that restriction may just be limited to release. 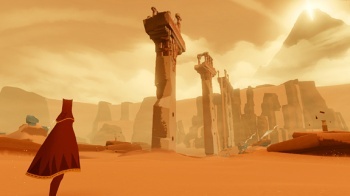 When asked about his interest in developing a game for the Vita during a recent interview with pushsquare.com, Thatgamecompany co-founder Jenova Chen neglected to say yes or no, instead remarking, "Thatgamecompany had a three game contract with Sony, so the past three games had to be Sony exclusive. Right now we are very much exploring ways to bring our games to a bigger audience, beyond just PlayStation. We are still in the process of negotiating, but I hope that we can announce it [soon]. But right now it's still in the process." While Chen's answer is somewhat evasive, I think it's safe to say that further Sony development is not at the top of his company's current agenda. What's more difficult to say is whether Thatgamecompany is planning to move its existing catalog of (soon to be) three titles to a platform such as Xbox Live, or simply ready to begin development on some yet-to-be-announced new IP that would enjoy a wider distribution at launch. Either way, if Chen is to be believed, we'll all know the answer soon enough.